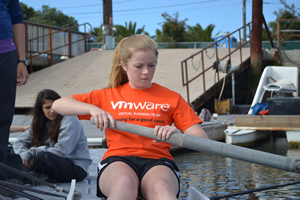 Norcal offers learn-to-row camps in the summer for middle and high school students. Each camp is one week long. The camp is designed for students who are completely new to rowing and teaches the basics of safety, technique, and training. Already have some rowing experience? For members of our recreational rowing program during the school year and for campers returning for multiple sessions of camp, Norcal offers an advanced track at learn-to-row camp. Athletes will be divided into groups based on skill and will learn more in-depth topics about the sport. The timing and location are all the same for the advanced and novice tracks of camp. During the week, campers will spread their experience among singles, fours, and eights. Potential coxswains will be able to try coxing, as well. In addition to on-the-water training, the camps help athletes get a jump-start on their fitness. This is a great opportunity for a new novice looking to prepare to join a competitive rowing team. Each camp involves running, erging, stretching, and core work. Although rowing does not involve being IN the water; ALL campers MUST know how to swim for safety purposes. While all campers are welcome at all sessions, we are using some sessions as focal points for certain age and experience groups. While we encourage campers to choose the session with the best match, we will ensure that all campers receive age appropriate instruction regardless of session. This session is for Campers in 6th, 7th, and 8th grade. No experience is necessary for this introduction week. This camp is co-ed. Campers will learn how to safely handle the equipment, the basics of the rowing stroke, how to train on the rowing machines (ergo-meters) and will get exposure to all components of rowing on the water in 8 person shells, single person shells and coxing. We will spend some time on land and water each day introducing campers to all facets of rowing. This session is for high school athletes (including but not limited to campers entering the 9th grade this coming fall). No experience necessary for this introduction week. This camp is co-ed. Campers will learn how to safely handle the equipment, the basics of the rowing stroke, how to train on the rowing machines (ergo-meters) and will get exposure to all components of rowing on the water in 8 person shells, single person shells and coxing. There will be an introduction to the fitness component of rowing and what it’s like to be a part of the NorCal Novice high school teams. Campers must have completed one week of Intro to Rowing before the beginning of this camp and/or completed one of the school year Rec sessions. Camps do not have to be consecutive weeks. We will be on the water for most of the camp working on more advanced technique and understanding of how to move the boats. The goal of this camp is to demonstrate what we do on the Norcal Novice teams and to teach technique that builds on the basics learned in the intro session. We emphasize team work, introduce more rowing fitness concepts and provide an environment for each camper to improve their rowing skills. These camps are designed for athletes who participated in our middle Recreational Team during the previous school year, or other extended rowing experience. It is not appropriate for athletes who are rowing for the first time, or whose previous experience is limited to 1-week programs.